Four: Four. Carlos Vidriales, certification, pages 6 and 7. Carlos Vidriales, certification, 8 pages. Arms of Carlos Vidriales García Bustamante painted by me in the Certification of the King of Arms of Castile and Leon Alfonso de Ceballos-Escalera and Gila, Marquess of La Floresta, Viscount of Ayala and grand of Spain. The image shows the pages 6 and 7 of this certification. Alfonso de Ceballos-Escalera y Gila is the author of the certification of arms. 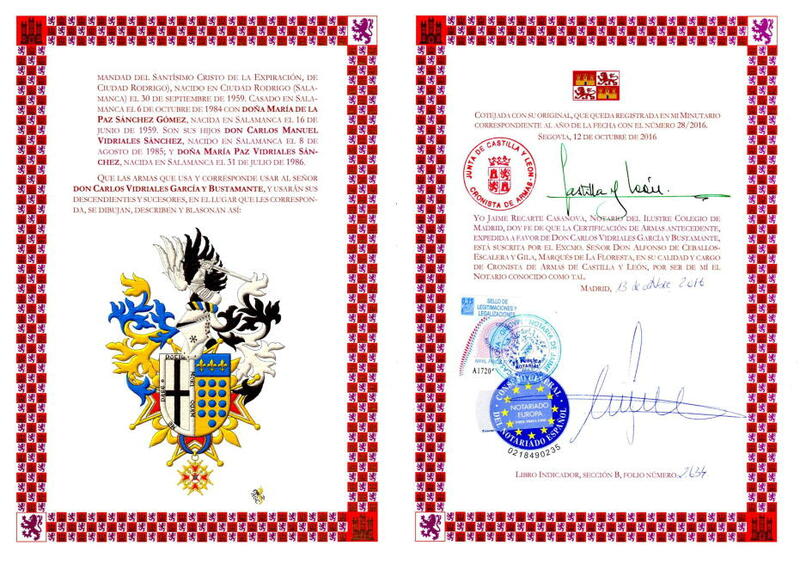 Antonio Salmerón y Cabañas is the author of the heraldic art for the certified coat of arms. Categories: Certification, Coat of arms, Interpreted, Personal, Semi-circular, Illuminated, Outlined in sable, Party per pale, Argent, Cross, Sable, Bordure, Motto (motivation), Or, Thirteen, Hurt, Hurt, torteau, pellet, pomme and golpe, Azure, Three, In pale, Four, Five, Chief, Fleur de lis, Lineage, Accolé, Decoration, Cross, Suspended and Base. Root: Vidriales García y Bustamante, Carlos. Arms of Carlos Vidriales García Bustamante painted by me in the Certification of the King of Arms of Castile and Leon Alfonso de Ceballos-Escalera and Gila, Marquess of La Floresta, Viscount of Ayala and grand of Spain. 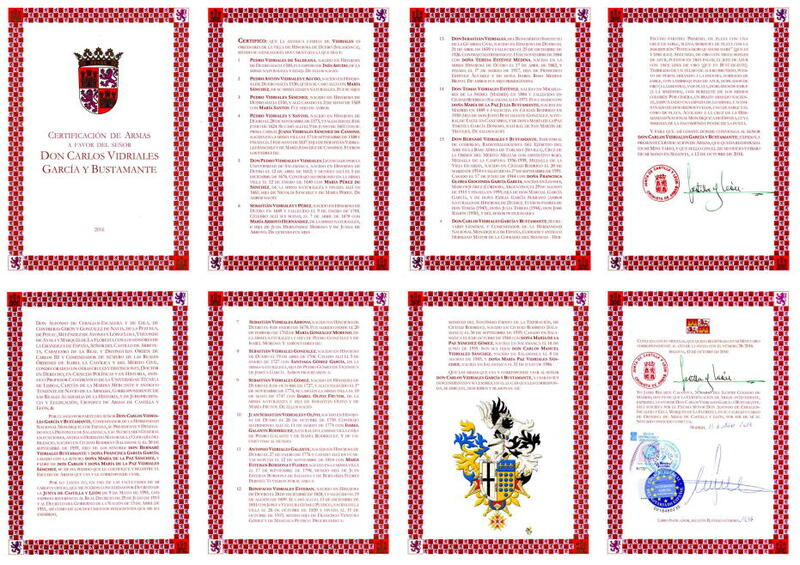 The image shows the 8 pages of this certification. 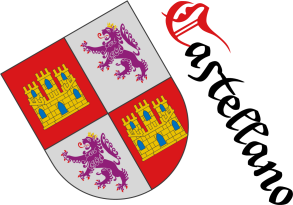 Credits: Alfonso de Ceballos-Escalera y Gila is the author of the certification of arms and Antonio Salmerón y Cabañas is the author of the heraldic art for the certified coat of arms. Interpreted coat of arms: with a semi-circular shape; illuminated with metals argent and or and colours sable and azure; outlined with sable; and a freehand finish. 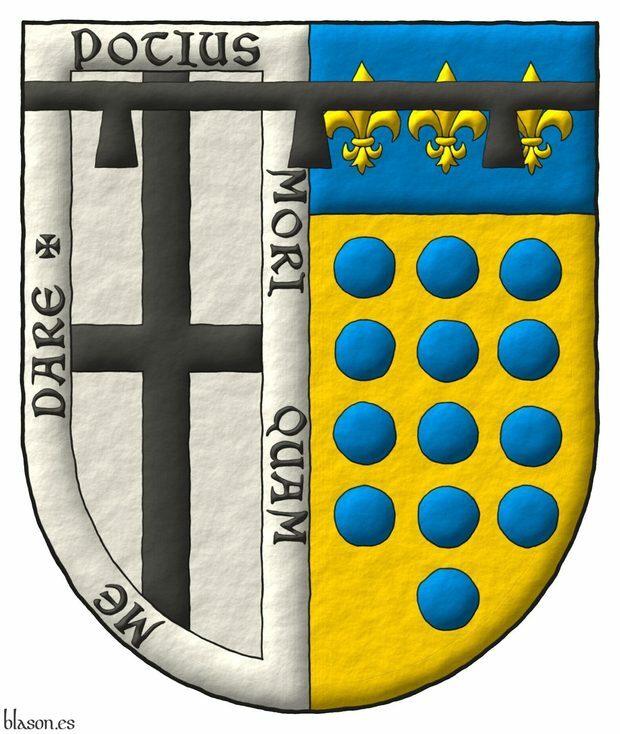 Blazon keywords: Party per pale, Argent, Cross, Sable, Bordure, Motto (motivation), Or, Thirteen, Hurt, Hurt, torteau, pellet, pomme and golpe, Azure, Three, In pale, Four, Five, Chief, Fleur de lis, Label and Suspended. Style keywords: Freehand, Semi-circular, Illuminated and Outlined in sable. Classification: Coat of arms, Interpreted and Personal. 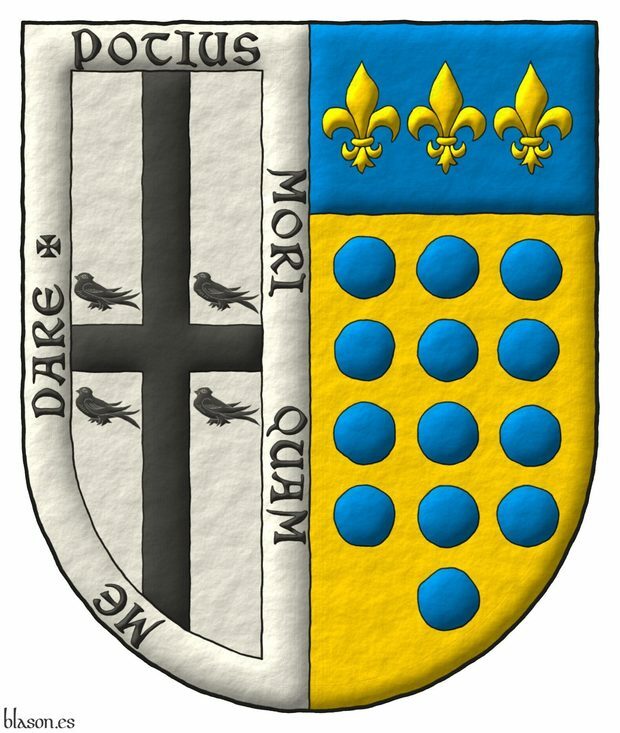 Blazon keywords: Party per pale, Argent, Cross, Sable, Bordure, Motto (motivation), Or, Thirteen, Hurt, Hurt, torteau, pellet, pomme and golpe, Azure, Three, In pale, Four, Five, Chief, Fleur de lis, Cantoned and Martlet. Blazon keywords: Or, One, Head, Chinese dragon, Gules, Langued, Azure, The eyes, Argent, Sable, In base, Branch, Oak, Three, Leaved, Slipped, Vert, Fructed, Two, Acorn, Bordure, Four, Rose and Fleur de lis. Style keywords: Watercolor, Illuminated and Round. Blazon keywords: Ermine, Pale, Vert, Quill, Or, Chief, Wavy, Chinese dragon, Dragon, Gules, Pasant, Armed, Langued, Azure, One, Head, The eyes, Argent, Sable, In base, Branch, Oak, Three, Leaved, Slipped, Fructed, Two, Acorn, Bordure, Four, Rose and Fleur de lis. Style keywords: Freehand, Illuminated, Pointed, Outlined in sable and Round. Classification: Coat of arms, Interpreted, Personal and Badge. 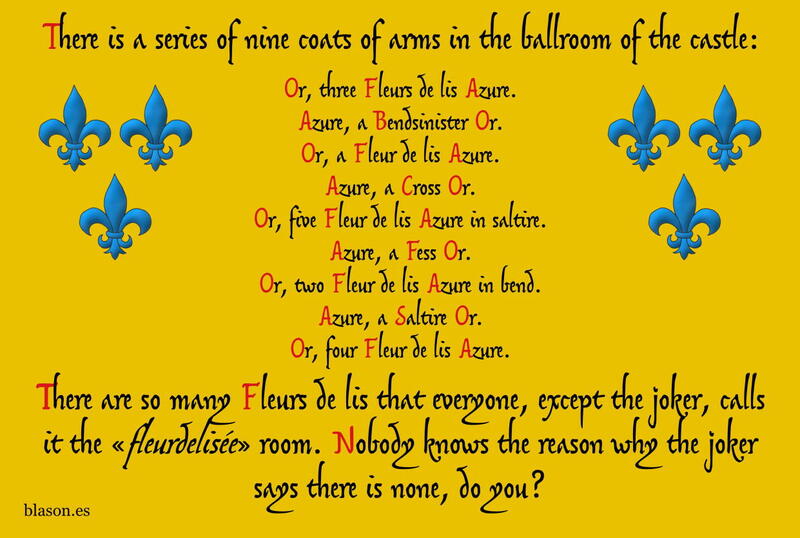 Accolé, Azure, Bend sinister, Acorn, Bordure, Head, Certification, Five, Round, Decoration, Cross, Cross, Four, Outlined in sable, Two, Chinese dragon, In pale, The eyes, Coat of arms, Fess, Fleur de lis, Fructed, Personal, Gules, Leaved, Illuminated, Badge, Interpreted, Chief, Langued, Motto (motivation), Lineage, Semi-circular, Or, Party per pale, Suspended, Argent, Oak, Hurt, torteau, pellet, pomme and golpe, Hurt, Rose, Sable, Vert, Saltire, Thompson, Neil, Freehand, Thirteen, Three and One.